Introducing the blog Lahore Nama. I visited Lahore for the first time in 2006 and found it filthy, smoggy, and very third-world. Like Delhi. Obviously I loved it. I sensed more similarities: Punjabi gaalis, Mughal-era forts, colonial-era monuments, old-city bazaars, leafy districts, and broad avenues. And yes, Delhi has Lahori Gate and Lahore has Dilli Gate. But this sort of sameness is an illusion. Let’s not forget that Lahore is a Pakistani city and Delhi is Indian. We two are separated by past, present, and passports. More than 60 years have passed since the creation of our two nations. 60 years should be but a blip in the life of great cities like Delhi and Lahore but meantime much has changed in their characters. And character is destiny. Both cities have continued to grow in ways that makes them very different from each other. Delhi lost its Muslim refinement. Lahore lost its Hindu heritage. Today there are three cities of Delhi and three cities of Lahore: what they used to be; what they are now; what they could have been. The Delhi Walla has been in the quest of those Delhis for more than a year. 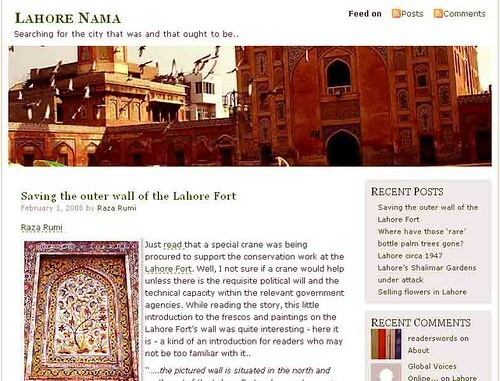 It now feels privileged to share with readers its discovery of Lahore Nama, a blogsite that it is attempting to capture a Lahore “that was and that ought to be…” Started by Mr. Raza Rumi, an eminent Pakistani blogger, Lahore Nama is the brother-blog of The Delhi Walla. I’m a Pakistani and I want peace between India and Pakistan. Having said that I feel irritated when our peaceniks try to imply that both of us countries are same. People from Delhi would come to Lahore and say it is very much like Delhi which is not true. I have been to Delhi and it is a very diffrent from Lahore. We are two very diffrent cities. Thanks for showing Lahorenama blog. Your Delhi wallah blog is very good. This was such a surprise –Many thanks for this post and introducing Lahore Nama to the Delhi Wallah visitors. You comment was touching and Lahore Nama will aim to grow into a brilliant blog like DW. Anonymous: what you wrote is true but then if you were to look closely, Lahore and Delhi share a lot in common. grea article. but why lahore nama? why not lahori? Readers are requested to note that this blogsite is spelled as <>The Delhi Walla<>, not <>The Delhi Wallah<>. LahorewallahLahorenama in Persian would mean the ‘the chronicle of Lahore’. On the other hand Lahori would be about the person or an individual. Lahore walla would be copying Mr Soofi and who knows that he is particular about the copyrights of his blog title and its matchless content.Mayank ji: Sorry for the veiled rebuke. We the humble readers will be more careful. can you please correct the comment entry above?